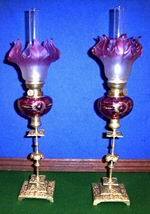 A wonderful rare pair of antique wall mounted ruby glass peg oil lamps . 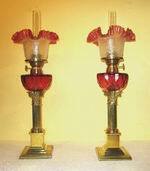 A wonderful rare pair of antique wall mounted ruby glass peg oil lamps with beautiful ruby glass fonts and conforming shades, The brass brackets allow the lamps to swing and be adjusted. 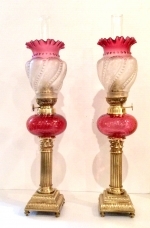 The brass fittings in full working order with wick adjustment wheels.These lamps benefit from being hand cleaned and lacquered . 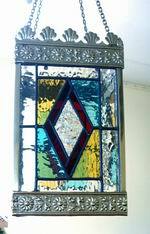 14ins high x 9ins from wall x 4ins dia shade. 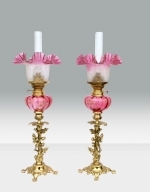 Beautiful Pair of Marble Table Lamps with Ormolu mounts. 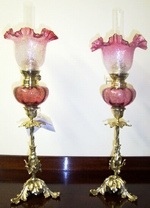 A Beautiful Pair of Marble Table Lamps with Ormolu mounts in the form of floral sides on swept legs sitting on Paw feet . Re-wired and Pat tested . 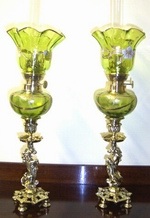 Fabulous Pair Of Antique Lemon Satin Glass Peg Lamps. 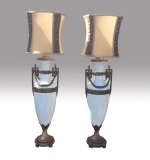 Very Rare Antique Blue Tall Oil Lamp With Wonderful Original Blue Etched Football Shade And Fabulous Blue Font. 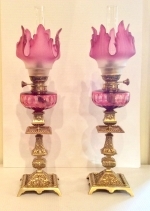 Beautiful Brass Corinthian Column and Double Burner. Excuse shadow on brass column,bad photography. 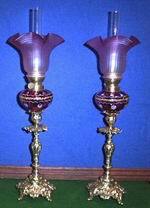 All brass cleaned and lacquered. 18ins to top of Funnels. 20ins to top of Funnels. 19ins to top of Funnels. 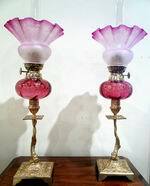 Fabulous Matching Pair Of Original Antique Ruby Glass Oil Peg Lamps. 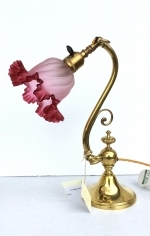 Quality Antique Adjustable Brass Desk Lamp With Original Cranberry Shade. 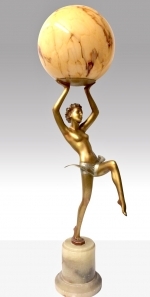 Weighted Brass Base 6ins diameter. 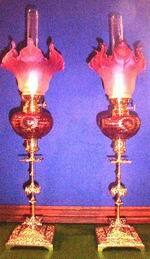 With Amber Coloured Football Shade And Amber Coloured Milk Glass Bowl On Quality Corinthian Brass Column. 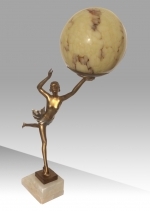 BASE WITH A VERY GOOD QUALITY ORIGINAL ROUGE CREAM MARBLED GLOBE. 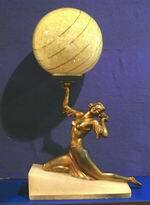 22ins HIGH,[51CM] GLOBE IS 5.5INS DIAMETER, BASE 4.5iNS. 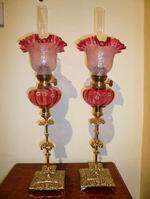 Magnificent Tall Antique Cathedral Ruby Glass Oil Lamp With Fabulous Ribbed Ruby Font and Beautiful Etched Ruby Glass Tulip Shade. 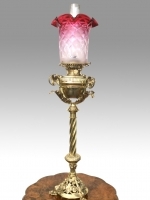 38ins tall x 9ins diameter shade. 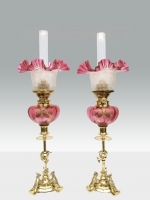 A wonderful rare pair of antique wall mounted peg oil lamps with beautiful satin glass fonts and conforming shades, The gadrooned glass merging from pale pink to deep pink with glass funnels inside. 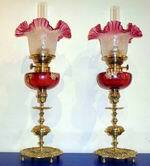 The brass fittings in full working order with wick adjustment wheels.These lamps benefit from being hand cleaned and lacquered . 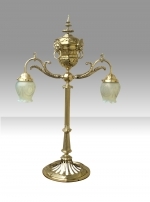 Wonderful Antique Victorian Brass Corinthian Column Telescopic Standard Oil Lamp. 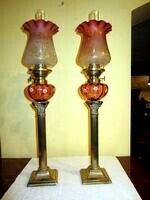 Wonderful Antique Victorian Brass Corinthian Column Telescopic Standard Oil Lamp. 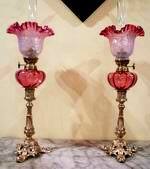 Original ruby oil bowl And Shade. 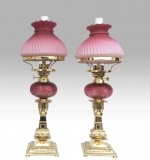 Fabulous antique Cloisonn� Corinthian Column Oil Lamp with matching hand painted ruby glass bowl and shade. 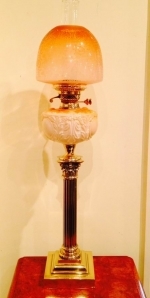 Fabulous Antique Gilt Brass Standard Lamp. 79ins x 17ins x 17ins. 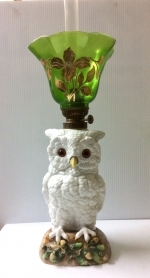 Antique Owl Oil Lamp With Green Hand Painted Shade. 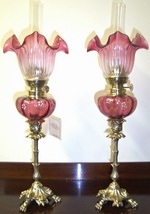 Stunning Matching Pair Of Original Antique Ruby Glass Oil Peg Lamps. 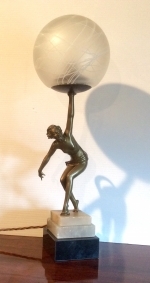 55cms tall x 13cms x 13cms. 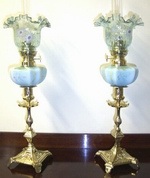 Superb pair of ormolu mounted white marble antique table lamps. 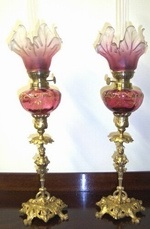 Superb pair of Gilt ormolu mounted white marble antique table lamps. 24ins high to top of shades. 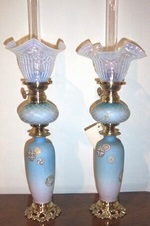 15.5ins high to bulb holder. 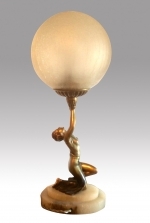 Stunning Large Antique Brass and Vaseline Glass Table,Desk Lamp. 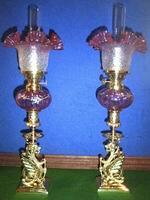 36.75ins x 24ins x 12ins deep base. 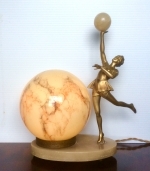 Lovely Antique Art Deco Lady Lamp. 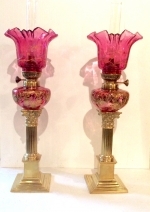 Stunning Pair Of Antique Ruby Glass Peg Lamps With Brass Corinthian Columns. 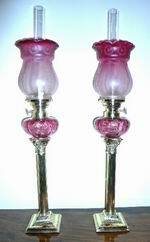 18.5 ins to top of Funnels. 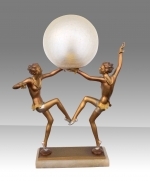 Fabulous stylish art deco twin figure antique lady lamp, circa 1930, the cold-painted gold and silver metal figures mounted on an alabaster base holding aloft an original crackle glass globe. 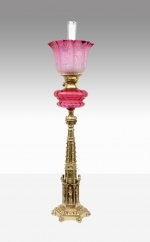 Fantastic Victoria Brass Antique Oil Lamp With Ruby Shade. 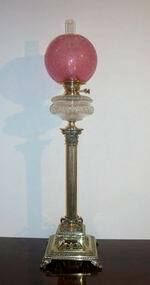 20ins HIGH,[51CM] GLOBE IS 5.5INS DIAMETER, BASE 3ins x 4.5iNS. 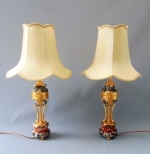 IT IS IN GREAT CONDITION WITH VERY LITTLE WEAR TO THE FINISH. 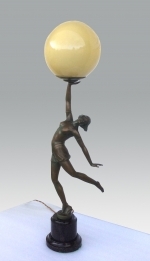 AN EXCELLENT VERY LARGE RARE ORIGINAL ART DECO SPELTER LADY LAMP ON A 'MARBLE TOP' HAT BASE WITH A CREAM GLOBE. 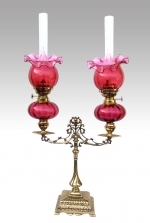 IT IS 29.5 INS TALL, THE BASE IS 5 INS ACROSS AND THE SHADE 6.5 INS IN DIAMETER. 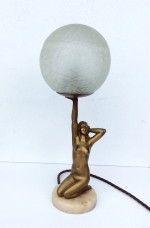 Beautiful Art Deco Antique Lady Lamp In wonderful condition. 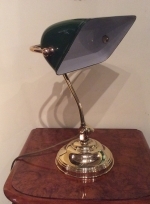 Quality original antique brass and green and white enamel bankers desk lamp. 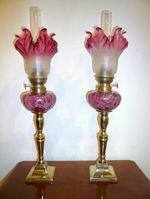 Beautiful tall antique oil lamp.